Personal Loans Canada: Fast, Safe And Affordable Personal Loans. Personal Loans are a lifesaver when you find yourself in a tight corner and you need money urgently. Many of us have been in situations where we really need to pay for something or buy something but don’t have the money to pay for it immediately. Often in such situation, many of us don’t want to bother friends and family with our financial worries or we simply don’t want them to know that we are that hard up. The only option left for us is to take a personal loan from a bank or from any lender that will lend us the money. Personal loans come handy when there is no one else to help us financially. If you live in Canada and you need money for an important expense, maybe to cover unexpected medical or educational expenses, clear a recurring bill or simply purchase an important item, you can apply for a personal loan from a Canadian bank or from a private loan company like Loan Away Inc. Loan Away Inc provide personal loans in Ontario, BC and in a few other provinces in Canada. Who Can Get Personal Loans In Canada? Personal loans are unsecured loans that can be given to anyone who has a regular source of income. Therefore, even if you are unemployed but have a provable regular source of income, you can have a personal loan. This means people on Government subsidy can also get a personal loan of some sort. This can be personal loans under $5,000, it all depends on the lending criteria of the bank or the lending company. Most personal loans do not require a collateral security. They are granted purely on the bases of the ability of the borrower to make regular payments on the loan and pay back the loan in full over a predetermined period of time. Lenders like Loan Away Inc grant personal loans to people with bad credit, so long as they can prove that they are able to make the regular payments on the loan and pay back the loan in full at the end of the loan period. To enable a person to meet their urgent financial needs, loans of between $500 and $5000 from Loan Away Inc are processed very quickly. Most mainstream financial institutions in Canada that offer personal loans use a credit scoring system to determine if a person qualifies for a loan. A person with a higher credit score rating most often qualifies for a personal loan while a person with a lower credit score or a bad credit score is often refused a loan. A person’s credit score depends on their credit history. A credit history is built over time and details how responsible a person is in paying their debts. The better the credit history the higher the credit score rating. A credit history starts from the first time that a person accesses a credit facility. This means a person who has never accessed a credit facility will not have a credit history. Sometimes, not having a credit history is as bad as having a bad credit history. The main difference though is that it is easier to build a new credit history than to repair a damaged one. A person with no credit history and who want to establish one will simply have to access some kind of a credit facility, even if for some small amount of money. On the other hand, a person with bad credit or poor credit will need to pay off or at least pay down significantly any outstanding payments on their account with lenders. Most financial institutions assume that people with higher credit rating pose less risk and have the ability to repay loans without defaulting. People with a lower credit rating are often considered to be less credit worthy and have higher risk of defaulting on the loan and therefore are often refused a loan by the banks. 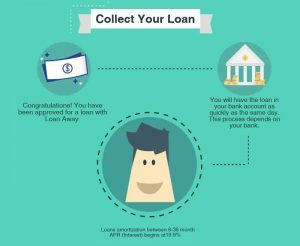 Determining How Much Personal Loan You Can Have. Apart from the credit score being used to identify the people who qualify for credit, a credit score also helps to determine the amount of money a person qualifies for and the interest to be charged on the money. People with a higher credit rating most of the time qualifies for higher amounts of loan than people with a lower credit rating. The amount of interest charged on the money borrowed by a person with a higher credit rating can also be less than the amount of interest payable by a person with a lower credit rating. One more thing about applying for a personal loan is that, if you have a lower credit rating but a bank decided to grant you a loan, they may not allow you to spread the payments over a longer period of time. This is because in the eyes of the banks, the longer the time you have to pay back the loan and the interest accrued on it, the higher the chances of you defaulting on the loan. Those with a higher credit rating and who have a good history of loan repayment can have a loan repayment period over a longer period of time. One aspect of personal loans that make them attractive is that they have fixed interest rates and fixed payment periods. A personal loan is not a revolving credit like a credit card facility, which is a form of a loan but does not require full repayment of the credit facility over a specific term. Revolving loans like credit cards do not have an end period of full payment. The interest rate also fluctuates with time.For personal loans, the repayment period can be between 24 to 60 months depending on the amount borrowed. The interest is fixed and is calculated depending on the period for repayment of the loan. For personal loans, the full amount, plus interest is expected to pay back from 12 to 60 months, depending on the amount borrowed. The interest is fixed and is calculated based on the period for repayment of the loan. There are some few things to consider before you apply for a personal loan. First, you will need to know how much you want to borrow or how much you can qualify for and the interest rate payable on a loan granted. Consequently, before applying for a loan, it is a good idea to know your credit score as that will determine whether or not you will get a loan and from what bank or loan company. Even if you qualify for the maximum amount of loan a loan that a company may grant you, it is important to look at your debt to income ratio. This will indicate how comfortably you can make the monthly repayments on the loan. The debt to income ratio is calculated by dividing your total monthly debt by your total gross income. The lower the debt to income ratio the better. For example, if your total monthly debt repayment is $1,000 and your gross monthly income is $5,000, your debt to income ratio will be 20%. Many lenders use this ratio to decide whether to grant the loan and how much to grant. People with high debt to income ratio are often considered high risk borrowers even if they have a very good credit rating. As a result, most lenders will not be willing to give huge amounts of money to such people. If you want to borrow a larger sum of money, try to consolidate your payments through a debt management plan or identify ways you can increase your monthly income in order to lower the debt to income ratio below 50 %. Once you are sure you have a good credit rating and your debt to income ratio is very low, you can apply for a loan from mainstream banks. Different lenders charge different interest rates. There are some lenders that may charge a lower interest rate but have other hidden charges included may increase the total amount of money that you will end up paying back. Before you choose a bank or a loan company, make sure you understand the terms of the loan and the interest payable on the loan, together with any applicable charges. Finally, it is important to note that having a lower credit score or bad credit, or a high debt to income ratio does not mean that you will never qualify for a personal loan anywhere. We don’t live in a perfect world and not everyone has a perfect credit rating at all times. Even people with previous impeccable credit history fall on hard times and sometimes are not able to make regular payments on their loans, thus ruining their good credit record. In spite of their poor credit history and bad credit status, private loan companies like Loan Away provide loans to people with bad credit. Companies like Loan Away focus mainly on the ability of the borrower to pay back the loan rather than on their so-called bad credit status. If you need a personal loan under $5,000 and you live in Ontario or anywhere else in Canada that Loan Away Inc operates, reach out to them and they will look at your case sympathetically, even you have a bad or poor credit history. About 90% of applicants have had their loans granted. There is no doubt that your application will also be considered with a view to granting you the loan.